I’ve spent my entire life living in a suburban cocoon, sheltered from the world’s harshest realities. I always knew that the famines, decades-long civil wars, and military coups that regularly decimate foreign countries can’t possibly happen here. Lucky me, I was born in the United States in a time of relative prosperity, although the political landscape has never been what you could call tranquil. I’m a baby boomer, by definition the child of a World War Two veteran. The Greatest Generation, my parents’ generation, fought the most virulent forms of Fascism in Germany and Japan to ensure that those scourges couldn’t invade our lives. True, we lived our entire lives under a nuclear cloud, practicing futile remedies like duck-and-cover when we were kids, but we could count on Mutually Assured Destruction to keep us safe. It seemed the Soviets, like us, weren’t totally crazy. There have been many books and movies that plausibly envision all sorts of nightmare scenarios. Some of the “what-ifs” that have made the greatest impression on me include 1984 (what a high-tech totalitarian society would look like), It Happened Here (if England had lost the Battle of Britain and been conquered by Hitler), Seven Days In May (if the US military attempted to overthrow the president), and most chilling of all, Level Seven (total nuclear annihilation). After imagining the worst, I feel relieved that it hasn’t happened yet. I have an urge to step outside and breathe in the sights and sounds of my own lawn, where life persists, unaware of any existential threat. 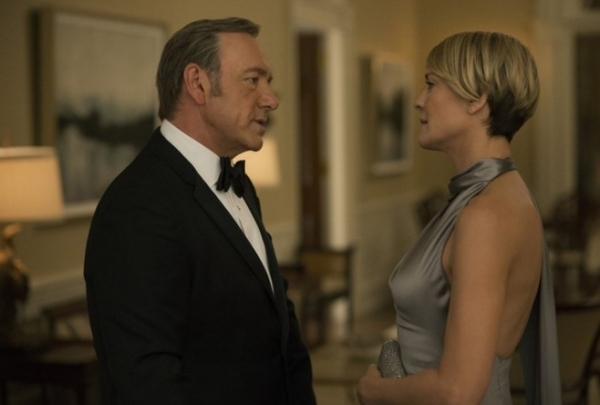 How believable is Frank Underwood, the fictional president of this series? As of this date, he’s already murdered two people by his own hand, and has an equally thuggish chief of staff doing dirty work for him on the side. In one recent scene with his own Secretary of Defense, a potential political rival, he seems to confess to his previous murders and threaten her with the same fate, only to back off and say he’s kidding. As he obviously intends, she is left unsure whether she’s really in danger or just paranoid. Yet if Underwood were real, I would vote for him over several of the current presidential candidates. I’d even vote for his wife Claire, who has maneuvered herself into a spot on his ticket. The Underwoods at least take some reasonable positions, if only for expediency’s sake. When I studied Political Science in graduate school over thirty years ago, I thought I had acquired a decent grasp of “what can’t happen here” in the political realm. But in 2016, we might as well shred those rules. There are practically no limits now to what certain candidates can say or do and remain beloved by their fans. I suspect that deep down, many of these politicians know how unreasonable their positions are, but they have gotten into the habit of pandering to an uninformed electorate instead of trying to educate their followers. Since there’s no point in agonizing over what I can’t control, I amuse myself these days by pretending that the ongoing election is a novel, and the candidates are colorful if implausible characters. Only what self-respecting editor wouldn’t red-ink characters like these? Honestly, I don’t think I have enough imagination to make up Donald Trump. When has such an ignorant buffoon come so close to the presidency, even in fiction? Charlie Chaplin’s 1940 film “The Great Dictator” satirized characters such as Adenoid Hynkel of Tomainia and Benzino Napaloni of Bacteria, who tragically had real-life counterparts. Is the present situation so different? Here is a man who accepts Nazi-like salutes from his followers, has expressed admiration for Mussolini, has reportedly studied Hitler’s speeches, and encourages his goons to beat up any detractors. He refuses to repudiate the support of white supremacists, and threatens media outlets that criticize him. But let’s jump ahead and contemplate what President Trump would be like. Since candidate Trump has yet to show the slightest grasp of how the US government works, we must assume he would expect to enter office wielding dictatorial powers. How would he react when he discovers the concept of checks and balances? Michael Hayden, former NSA and CIA director, has said that some of the orders Trump intends to issue as commander-in-chief would be illegal, and could well trigger a coup. His signature policy initiative would start at least a trade war with Mexico, our largest trading partner, if not a hot war. Meanwhile, if he follows through on his promise to deport 11 million immigrants, he would create all the necessary ingredients for a civil war. Would Trump last even a year in office? I can see him quitting in frustration when he finds the job more difficult than he imagined. Certainly some of his actions, if he tried to carry them out, would be impeachable. Like Chaplin’s dictators, he’s extremely childish, given to temper tantrums if he doesn’t receive the adulation he thinks he deserves or otherwise fails to get his way. Imagine putting someone with the temperament of a five-year-old in charge of the military and the nuclear codes. He might blow us off the map before we had a chance to impeach him. This is really nothing new for Republican candidates, many of whom have demonstrated an appalling ignorance of our national history. Trump himself was recently asked in an in-depth interview what he thought of Lincoln’s accomplishments. After he had rambled for several minutes, it was clear to the interviewers that he had no idea what Lincoln did. He touts an “America First” foreign policy, showing no awareness of what that phrase meant in the late 1930s. Sarah Palin, former Republican VP candidate, didn’t know that World Wars One and Two were fought in the twentieth century. And then there’s my personal favorite, former Congresswoman and presidential candidate Michelle Bachmann congratulating the founding fathers for their great courage and fortitude in abolishing slavery. American history is a great story in itself, and really needs no exaggeration or enhancement. It has all the drama, vivid characters, crises, and triumphs that anyone could want. Even some of the duller personalities that populate our history were interesting in their own plodding way. Maybe that’s why we crave over-the-top scenarios in fiction that portray our leaders as criminals, clowns or worse. Authors must do all they can to keep up with reality.